A couple of years ago when I first designed this fly a famous fly angler commented “There’s no need for all that”. 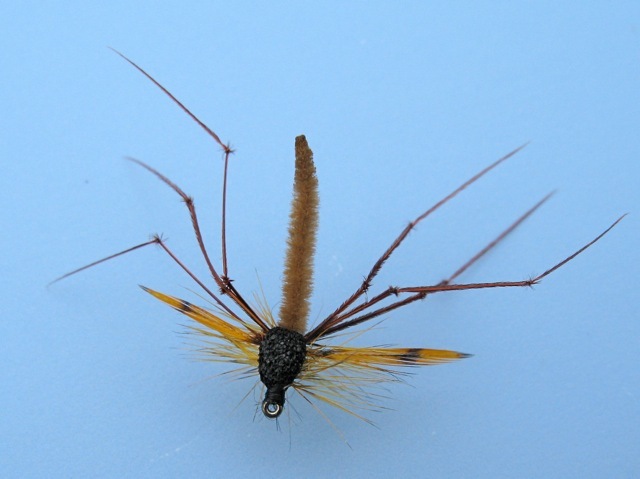 Meaning that there are simpler versions of the Daddy Long Legs. Of course there are! And many more complicated ones as well. My point is, I really enjoy tying this pattern and it has caught me lots of fish. Surely that’s what it’s all about? Hook. Kamasan B 100 size 12 or similar. Detached Body. Brown suede chenille. Thorax cover. Black Micro Thin Foam. Put the hook in the vice. Take a piece of the suede chenille about ¾ on an inch long. Singe one end with a flame and remove ¼ of an inch of the chenille from the other end exposing the core. Tie this in on top of the hook leaving just enough room for the thorax. 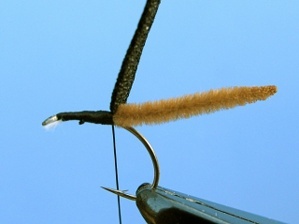 Tie in the foam thorax cover where the chenille meets the hook. 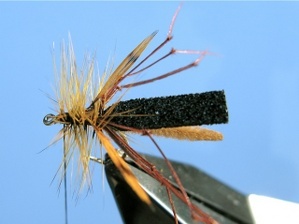 Tie in the hackle against the thorax cover. Then moving forward towards the eye of the hook tie in the legs (3 each side) Then, moving forward again, tie in the two wings leaving a small gap behind the eye. 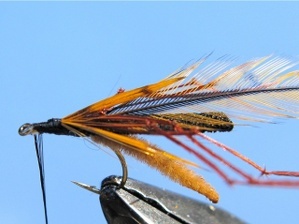 Carefully wind the hackle forward between the legs and the wings and tie off behind the eye. 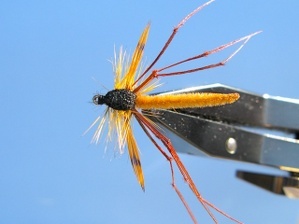 This will force the legs and then the wings forward giving the fly a more natural look. Trim the top of the hackle, then pull the foam thorax cover forward and tie off behind the eye. (This will also help to keep the legs and wings firmly in position.) Remove the excess, whip finish and apply a little varnish. Job done…Catch a big one! Previous Previous post: ‘Dream Team’ Win The ‘One Fly’!